A photo contest in Azerbaijan, a panel on Senior Volunteering in Turkey, activities with the local Red Cross in Bosnia and Herzegovina to celebrate the support of volunteers during the migrant crisis – these are some examples of how IVD 2018 is being marked in Europe and the Commonwealth of Independent States. Two young Roma community members serving as UN Volunteers in their communities in Serbia. 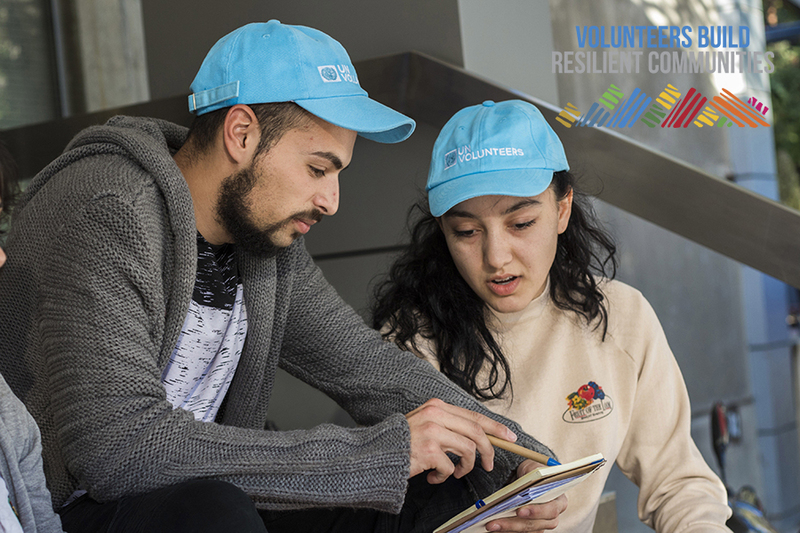 In Azerbaijan, IVD organizers hosted an online competition during October and November, which was designed to recognize Azerbaijani volunteers through written, photo and video submissions of their volunteering work for community resilience in action. The event on 5 December will showcase these volunteering stories at an exhibition, as well as reward the winners. In Turkey, UNV is preparing an event in Ankara on 7 December, with the purpose of presenting volunteering efforts, enhancing the understanding on how to develop volunteerism in Turkey, and raising awareness on senior citizen and intergeneration volunteerism concepts, among others. Along with speeches from community experts and panel discussions, Ms Ravdanur Cuma of the RavdaNur Foundation will share her inspirational life story as a young refugee in Turkey. In Bosnia and Herzegovina (BiH), hundreds of volunteers have been teaming up with the Red Cross, local governments and international organizations to respond to the migrant crisis in the Bihac area over the past year. On 5 December, the Red Cross will gather these volunteers and go to the Bihac area to help local communities where needed. This will be followed by the annual ceremony of awarding volunteers in appreciation of their services. Raising awareness on the importance of volunteerism is on the agenda in Kosovo (as per UN Security Council Resolution 1244). On the 4th of December, the University of Pristina (Center for Career Development), UNV and UNICEF Innovation are holding an information session to educate the audience on this topic and share inspiring stories from volunteers. On 5 December, the Ministry of Culture, Youth and Sports will host an event to highlight the importance of volunteering for the development of local communities. Russia and Serbia are each planning a briefing session to celebrate the day. In Moscow, presentation of the State of the World’s Volunteerism report took place along with panel discussion with volunteers and community experts, highlighting insights on trends and the status of volunteering, and providing a bigger picture on what individual volunteers’ efforts are bringing to the table in terms of domestic and international development. In Belgrade, Smart Kolektiv and the UN have organized an event to raise awareness on building more resilient communities, and in particular shedding light on the UNDP/UNHCR project “Local Initiatives for Improved Social Inclusion of Young Roma”. In this project, 30 selected young Roma are trained in local self-governments to help close the equality gap in their respective communities. The main event in Astana, Kazakhstan, aims to provide some insight on what it is to be a volunteer, through the sharing of personal stories of volunteers, as well as the video, “One day of UNV in UN House in Astana”. From 25 November to 10 December, volunteers will also contribute to advocating for changes towards domestic violence. In Kyrgyzstan, UNV is organizing a fair in Bishkek that focuses on promoting a ‘Healthy Lifestyle’. The UNV station will be hosted under the mental wellbeing aspect and will promote volunteerism as an opportunity to improve mental health. UNV convened a one-day workshop in Kyiv, Ukraine, on 1 December to share best volunteering practices in Ukraine and abroad. On 5 December, the America House is convening a weekly discussion for young people, which will focus on volunteerism and its value for modern communities.